To help prepare you for your Level 1 Certification we have prepared two important resources – The Certification Manual and the Video Library. 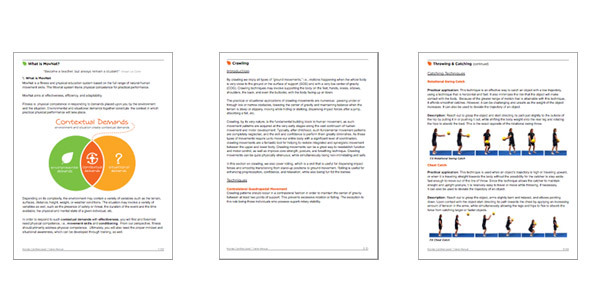 The Level 1 Certification Manual is designed to bring you up to speed with the fundamental principles & terminology that govern movement and MovNat coaching techniques. Additionally, it covers the coaching techniques required to begin teaching movement effectively and safely. The Manual is an essential resource both for certification and your continued practice. Each category of movement is further explained and discussed in a corresponding module. Techniques, biomechanical theory, skill progressions, safety concerns, and a series of drills are covered in each module. For example – The Running module addresses popular misconceptions about the kinetic energy of a body in stride – how to align the spine with proper posture to take advantage of the inherent gravity of the running incline, foot strike position, leg pull, landings per minute, etc. Multiple drills are included. The Lifting & Carrying Module covers common misconceptions about weight and stress on the body, “It is not the load that breaks you down, it is the way you carry it.” – We cover the essentials of muscular spinal protection, Selective Tension & Abdominal Bracing, The Valsalva Maneuver, Forceful Exhalation & Intercostal musculature, etc. Techniques covered in detail include the Dead Lift, the Push Press, The Lap Carry, & the Waist Carry. All specific techniques covered in the module contain practical application drills, progressions, and safety reminders. This section covers the best practices and considerations for teaching MovNat classes, workshops, and one on one training sessions. The specifics of the current fitness landscape, public perception, and appropriate venue are discussed. We cover all the safety concerns and practical considerations that go along with teaching Natural Movement in the real world. Upon completing your registration, you will also be given access to the video training library. This excellent resource is designed to make your certification process as rewarding as possible. If you register today, you can start training today. 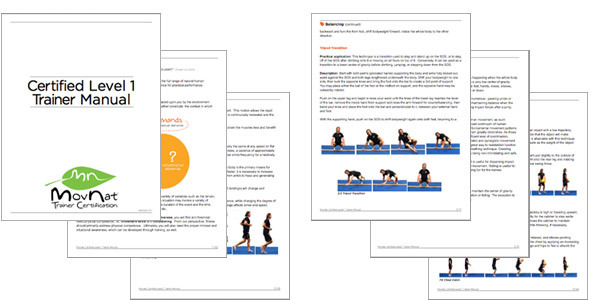 These videos take you step by step through each movement in the Level 1 Certification. Watch Erwan Le Corre explain the principles behind each movement you will be tested on. You can train right along with Erwan as he goes step by step through each movement. Upon registering, you will also have access to a level specific Progression Manual on your account. This manual will identify the key steps (i.e. progressions) to learning and teaching each skill covered in the course. “Restoration Series 1 – Primary” Follow along, voice over video practice on YouTube. We trust that if you make use of these extensive resources, your certification experience will be a complete success.